Nailers are one of the quintessential tools for woodworking projects as you will have to use them for almost all your projects. But when it comes to finishing carpentry or woodworking, the finish nailer always outperforms the many other types. Finish nailers are always the tool to go when building furniture, working on the deck or patio, and for general indoor and outdoor home improvement projects. As the name suggests, the finish nailer is for finishing projects where you are concerned with both the holding power and aesthetics. And when it comes to the holding power they are a much better option than the Brad nailer and many other nailer types. Like most other nail guns, finish nailers are available in pneumatic, electric and gas-powered models and also in different gauges. Understanding the different types and gauges of these nailers and other factors that define them such as the magazine type, nail depth, size, and weight makes it easier to get the best finish nailer. This guide provides all this and much more information to help make your search for a good finish nailer much easier. You can also read other nail gun reviews such as framing nailer, flooring nailer, brad nailer, roofing nailer, pin nailer, siding nailer, palm nailer. Choosing a good finish nailer for your DIY, home improvement or professional contractor project should not be hard if you know the best brands and models to go for. And in our table below we compare 10 best-rated finish nailers from some of the leading brands to help you with this. Hitachi NT65MA4 shows why many DIYers and woodworkers love angled finish nailers. The 34-degree angled magazine allows users to get into tight spaces with ease which makes this nailer suitable for almost any project. Another unique feature about it is that it also comes with an integrated air duster that can be very useful when you want to clear dust and debris from the workpiece before nailing. Jam clearing is also super easy and quick for this nailer, and the best thing about it is that the design of the nose ensures that you will not need any tools to do it. The depth-of-drive adjustment will also not require any tools, and so you will always have more control over the nailer so that you can get professional finishes. The selective actuation switch on this 15-gauge nailer will allow you to choose between sequential and contact nailing depending on the project which can be a very convenient feature. There is also a comfortable rubber grip on this relatively lightweight nailer that helps to minimize hand fatigue, no-mar tip to protect the work surface, and a 360-degree fully adjustable exhaust port. Freeman is one of the brands that should be on top of your mind when shopping for the best 15-gauge pneumatic finish nailer as they almost never disappoint. Their PFN1564 15-gauge model lives up to this reputation, and it is designed with ease of use, convenience, and efficiency in mind. And it will excel in projects like baseboard installation, crown molding, cabinetry and furniture building. It is a dual trigger mode finish nailer which means you get to choose whether to use sequential or contact firing depending on the projects. Jam clearing is also a quick and almost an effortless process, and you will not even need to use any tool. The finger depth will also adjust easily to ensure flush fastening into any material. This finish nailer also comes with a soft rubber grip that provides a comfortable and secure hold, and the manufacturer will back it with a 7-year warranty. Being one of the cheapest items on our finish nailer reviews, the NuMax SFN64 will be a great choice for beginner woodworkers and hobbyists looking for something high-performing but affordable. It features a highly durable and lightweight aluminum body that will ensure that you get many years of service. And it is also designed with quick jam release to minimize downtimes and finger depth adjustment to make it ideal for various applications. NuMax SFN64 has a 360-degree adjustable exhaust that helps to direct the air away from the user’s face and debris from the workpiece. This 16-gauge finish nailer also comes with a no-mar tip to help prevent scratches and damages of the work surface, and an ergonomic grip for comfortable and secure operation. The highly durable and lightweight magnesium housing and the angled magazine are some of the highlight features of the Bostitch N62FNK-2. However, there are still some more good features that help to make it one of the best pneumatic finish nailers out there. And they include the tool-free magazine removal that makes cleaning and jam removal fast and easy. This finish nailer also has adjustable depth guide that ensures that you can sink the nails precisely. With a capacity of 130 nails, the magazine holds relatively more mails than many other 15-gauge nailers. It will operate at between 70 and 120 PSI and it comes with a carrying case, hex wrenches, and four profile tips. Also, Bostitch will provide an impressive 7-year warranty for this nailer. Makita AF635 is a well-built 15-gauge finish nailer with parts that are designed to last for many years. They include a lightweight magnesium body and a tough aluminum magazine. This finish nailer allows for tool-less depth adjustment to ensure that you get more precise and flush nailing. And it also has a built-in air duster that will help keep the work surface debris-free. The nailer will come with two removable no-mar tips and rubber bumpers which help to protect the workpiece from scratches and other damages. Other things that make this a top-notch finish nailer include the ergonomic rubber grip, 2-mode trigger selector, multi-directional exhaust port, and narrow nose design to provide a clear line of sight. Despite being the priciest item on our list, this finish nailer is worth the price tag as it is highly portable to allow you to use it almost anywhere. And it will come with both the battery and 1-hour charger to make it ready to use from the box. Like most other high performing finish nailers, it allows easy access to the nosepiece to make jam clearing easy without having to use any tools. It also allows users to choose either to use sequential or contact firing methods and it has some integrated LED lights that will help to illuminate the workpiece. This 16-gauge finish nailer will also come with a plastic storage case to make it even more portable and Dewalt backs it with a 3-year limited warranty. For a battery-powered finish nailer, the Porter-Cable PCC792LA is relatively lightweight. And so it is not only portable but also easy to handle for extended periods with minimal hand fatigue. You can also be confident of using it for long enough as it has a relatively long battery life and will fire up to 1,000 nails for every charge. This convenient finish nailer also allows for tool-free depth adjustment to make it ideal for different applications, and jam clearing is also fast and easy and you will not need any tools. The integrated multifunctional LEDs are also very useful for illuminating the workpiece and Porter-Cable will provide a 3-year limited warranty for this tool. If the price is your main concern when shopping for the best 16-gauge finish nailers, here is a highly affordable option for you. It is the cheapest finish nailer on our list but despite the small price tag it still performs well and this is more so when dealing with softwood. This finish nailer comes with a no-mar tip to help prevent scarring and denting of the workpiece, and it has a split nose design that makes jam clearing fast and easy. Also, this cheap pneumatic finish nailer has a convenient reload indicator to make it easy to tell when you need to add more nails and a zero nail lockout feature to prevent dry firing. Whether you are buying your first finish nailer or upgrading what you have, you can always trust DeWalt to have the best finish nailer for you. Their DeWalt D51257K is a straight finish nailer that will be very useful for a variety of applications. This handy finish nailer features tool-free adjustment of the depth-of-drive to make it ideal for different applications. Clearing jams is also a tool-free and easy operation. There is also a 360-degree exhaust that helps to direct the air away from the user for a more comfortable operation and low profile, no-mar pad to prevent denting or scratching the workpiece. When you buy this high-performing finish nailer, you will also get a free carrying case and some sample nails. The Smart Point Technology is one of the most outstanding features of the Bostitch BTFP72155. This technology entails giving the 15-gauge finish nailer a smaller nose for easy nail placement and without having to compress contact trip to actuate it. With this relatively smaller nose, users also get a better view of where they are driving in the nails. And it also has a dial-a-depth control for precise nail countersinking and a tool-free jam release mechanism to make jam clearing easy. And to make this finish nailer an even better buy, Bostitch provides an impressive 7-year warranty. Finish nailers are one of those tools that you can expect every seasoned woodworker, DIYer, or hobbyists to own. This popularity means that there are tons of brands and models available in the market. While the built quality and performance of most models is always improving, all are still not the same, and so you need to know how to choose the best among them. But, this should not be a problem if you understand and keep the following vital things in mind when shopping for one. Choosing between the angled and straight finish nailers is all about your personal preferences. However, it is important to know what each has to offer and the merits and demerits of using it. Straight finish nailers are the types where the nail cartridge is perpendicular to the tip of the nailer. They shoot a thinner nail than the angled finish nailers which means that the head is less visible on the wood and will require minimal filling. These nailers are bulkier than the angled types and they will not fit into tight spaces as the latter would. But, they are generally less expensive to buy and their thinner nails are also more affordable which makes them more economical to use. Angled finish nailers are the more popular types of the two, and this is more so for professional woodworkers and carpenters. In most cases, this is because they can do everything that the straight finish nailers can do and much more. These handy finish nailers will have the nail cartridge angling towards the grip to form an angular shape. This angled design is their greatest advantage as it offers an easy access of the hard to reach places and eliminates the need to hold the nailer in an awkward position when nailing angles. Angled finish nailers will in most cases have a small front end that makes them a great choice for nailing and trimming application where space is limited or congested. However, they shoot thicker nails than the straight finish nailers which leave more visible heads on the wood. But, because they are mostly used in tight spaces, in most cases this does not matter as the nails will still be hidden. The angled finish nailers are generally more precise and agile than the straight models but they are also more expensive with some models costing almost twice as much. Buying Advice: For professional woodworkers and seasoned DIYers that use finish nailers a lot, the right idea is to have both on their toolkit. However, if you only have to choose one, the angled finish nailer is a much better option as it can do everything that the straight finish nailer can do but the reverse is not true. But, if you do not see yourself working at difficult angles often, the more affordable straight finish nailers can still be a good choice. When it comes to the power type or source for finish nailers, there are three main options which are pneumatic, electric and gas. Pneumatic finish nailers use an air compressor to fire the nails into the wood and they are very popular with both DIYer and professional contractors. These nailers are quite powerful but their only downside is that the need for an air compressor means extra cost. Electric finish nailers rely on electric current as their source of power. They are available in corded-electric and cordless types. Corded electric finish nailers offer the advantage of continuous and uninterrupted operation while the cordless ones offer the convenience of portability. 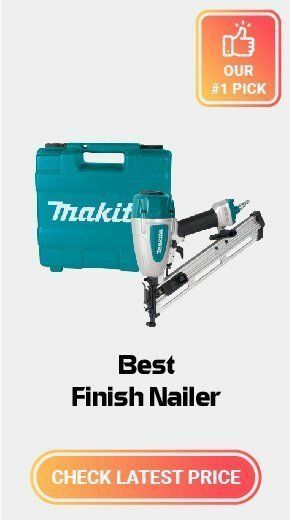 The nail magazine type is one of the key distinctions between finish nailers, and so it is also one of the key factors you need to consider when shopping for one. There are two main types of nail magazine which are the coil and nail stick. Coil Magazine: The coil style magazines will hold the finish nails in long, flexible strips that are then wound in a coil that can accommodate anywhere between 150 and 350 nails. Coil magazines tend to hold more nails than the nail sticks, and this leads to fewer downtimes as you can do more nailing before you need to reload the nailer. Also, these magazines do not stick out, and so they make the nailer more maneuverable. However, finish nailers that use coil magazine will cost far more than those that use nail sticks. Nail Stick: Nail stick style magazines are the type that will hold long strips of nails that in most cases come in 20-40 increments. The capacity depends on the size of the finish nailer but it is usually less than what the coil magazines can hold because there is no coiling. Some finish nailers will accommodate only one stick while others can accommodate two and in rare cases three. Finish nailers that use these magazines can be harder to maneuver in tight spaces as a result of the nail stick popping out of them. But they are generally more affordable. 15-Gauge: The 15-gauge finish nailers shoot the thickest nails, and so they will provide the most holding power. Most will use angled magazines for easy access into tight spaces. They are ideal for nailing solid surfaces and will be very useful for cabinetry, furniture building, trim and molding installation and also for upholstery trim applications. 16-Gauge: 16-gauge finish nailers will shoot slightly thinner nails than the 15-gauge models. They are also generally smaller and lighter and almost anyone can use them effectively. 18-Gauge: These are arguably the most popular nailers in the finish nailer family among DIYers and homeowners looking for something for occasional use. They shoot the 18-gauge brad nails and they are lighter than both 15 and 16-gauge nailers. Also, they are more capable of penetrating through softer or thinner workpieces without damaging them. 18-gauge nailers will excel in paneling, trim installation, furniture repair and many other projects. 23-Gauge: 23-gauge finish nailers will shoot the thinnest nails which are often referred to as pins. And they are perfect for any project that requires thin nails such as picture frame projects, small trim, birdhouse building and light wood assembly. Size and weight of the finish nailer are vital factors to take into account when choosing one as they will determine how easy and convenient it will be to use. Also, lightweight and compact finish nailers tend to be easier to transport from one worksite to the other, and this can be a significant advantage especially for professional contractors. A good finish nailer is one that gives you greater control over the nail depth. And this is because too much depth can damage the workpiece and less depth means that you will not get adequate hold power. Depth adjustment comes in different types and it will depend on the finish nailer brand and model. Most woodworkers and DIYers seem to prefer tool-less depth adjustment. However, the most important thing is to make sure that your finish nailer allows comfortable, easy and fast depth adjustment. Nail jams are almost inevitable when using any finish nailer, and so it is always important to go for a model that makes them easy to clear. The finish nailers that have a tool-free jam clearing feature are often the best as they ensure that you never have to waste a lot of time trying to clear a nail jam. A warranty gives you some assurances that the finish nailer will serve you for long, and so the longer the warranty the better. While the warranty length will vary from one brand to the other, anything between 2 to 5-year limited warranties is often good enough because very few brands offer longer warranties than this. Finish nailers are an essential woodworking tool that will be very useful to have in the workshop but it is important to choose the best from the various types and models out there. Understanding the different types of finish nailer and taking into account factors like nail gauge, depth adjustment and the size and weight will take you closer to finding your ideal finish nailer. For those that are not sure what brands or models to go for, our top 10 best finish nailer reviews above will provide some great recommendations.